Take them out to lunch – Spending time with those who matter the most to you means more to them than any gift you could purchase. However, if you are looking for a way to show that you care while giving them something to nosh on, take them out for a quick bite to eat at their favorite lunch spot. Do something thoughtful – It’s often said that the little things matter the most, and this could not be truer when it comes to showing others how much they mean to you. By doing something for your friend, spouse, or family member on this day to show them just how much they mean to you can speak louder than a gift ever could. Taking out their trash, mowing their lawn, or just running an errand for them can all help to show you care. Send them a basket of food – If this person is on the other side of the country or traveling during this treasured holiday, you can always send them one of our food gift baskets to let them know that they are a light in your life. Our Hearty Chili Fixins Dinner Gift Basket is an excellent option for those who are far away in proximity, but very near and dear to your heart. Looking for more food gift baskets? 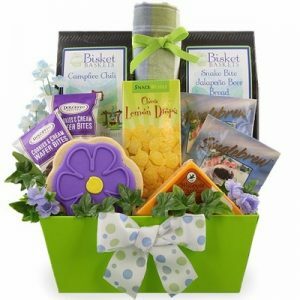 Shop our entire selection today at BisketBaskets.com.